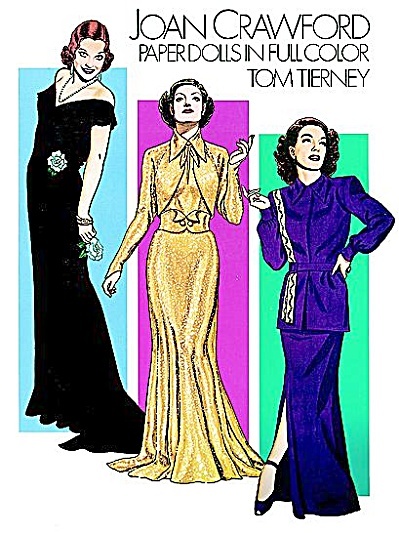 Tom Tierney's 1983 Joan Crawford Paper Dolls in Full Color by Dover Publishing is a booklet that has 3 life-like paper dolls and 28 costumes from 28 films which have been carefully rendered by fashion illustrator Tom Tierney. The dolls and costumes project Joan's many glamorous images. The booklet contains a short biography and captions on 16 full-color plates. The detailed costumes include tailored suits and dresses, evening gowns, dancing costumes, and and casual ensembles. The dolls are designed to be cut out. New.